An analysis of the semiconductor materials market and the drivers for growth in 2015. By all accounts 2014 is going to be a good year for the semiconductor industry; current semiconductor revenue forecasts point to mid- to high single digit growth and quarterly device revenues and silicon shipments are stronger when compared to the same period last year. SEMI believes that the semiconductor materials market will trend with the device market, resulting in an increase of three percent this year and a four percent increase in 2015, resulting in a materials market exceeding $46 billion in 2015. Despite two years of consecutive growth the total materials market will remain below its 2011 peak as cost reduction efforts and low overall industry unit growth dampened materials revenues over the past few years. Unlike last year, all regions are expected to see their materials markets increase this year. Since 2010, Taiwan has been the largest materials market due to its strong wafer manufacturing and advanced packaging base. The region is expected to increase its leadership by growing another seven percent this year. 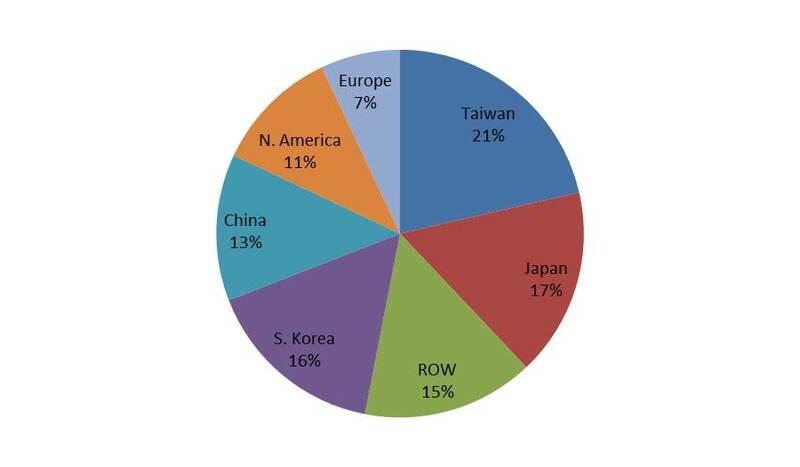 Japan, South Korea, and Rest of World as a group represent nearly 50% of the materials market and have an aggregate forecasted annual growth rate of one percent. Rest of World represents Singapore and other parts of Southeast Asia and represents the largest Packaging Materials market. After increasing four percent in 2013, growth in China is expected to moderate this year to one percent. The remaining portion of the market, Europe and North America, is expected to faire a little better, with an expected three percent growth rate, primarily driven by North America. Looking at materials trends by major materials category, historically Wafer Fab Materials dominated the materials market. This was due in a large part to silicon. However, starting in 2009, Packaging Materials made significant gains in the market due to extreme downward pricing pressure on silicon, increasing prices of gold used for wire bonding, and the growing necessity of advanced packaging materials required for mobile applications. 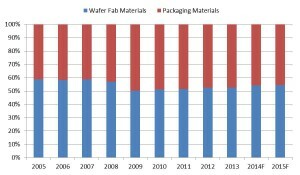 It is expected that the Wafer Fab Materials market will increase six percent this year, while the Packaging Materials market will remain flat, resulting Wafer Fab Materials representing 54% of the total materials market. The industry’s recent transition to copper and silver alloy wire has moderated the growth outlook for Packaging Materials since the impact of gold metal pricing in wire-bonded packages has been mitigated. Given the current market outlook for the semiconductor market, SEMI is forecasting that semiconductor materials will increase 3 percent this year and 4 percent in 2015. The Taiwan materials market is expected to cement its leadership position in 2014 and further expand its standing in 2015 as its growth outpaces the global materials market. The composition of the semiconductor materials market has evolved over the past decade as the need for advanced packaging materials has grown for mobile applications and silicon revenues account for a smaller portion of the market. The data are contained in a quarterly Materials Market Data Subscription (MMDS) Report published by SEMI. The MMDS tracks worldwide semiconductor materials market data and trends for key materials used in the manufacturing of semiconductors. The report contains 10 segments for wafer fab materials and 7 segments for packaging related materials. Lara Chamness is a senior market analyst for SEMI industry research and statistics.